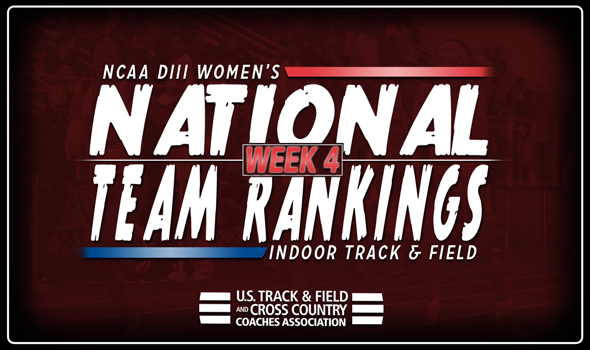 NEW ORLEANS – Just about everything changed between Week 3 and Week 4 of the NCAA Division III Women’s Indoor Track & Field National Team Computer Rankings. Twenty-three teams swapped spots when the newest rankings were released Tuesday by the U.S. Track & Field and Cross Country Coaches Association (USTFCCCA). The only teams that stayed in place from Week 3 were No. 6 UMass Boston and No. 25 Bowdoin. The new top-5 reads something like this: No. 1 MIT, No. 2 Johns Hopkins, No. 3 Ithaca, No. 4 George Fox and No. 5 Williams. This is the 13th time in history of the National Team Rankings that the Engineers have been billed No. 1, while it’s the best ranking in program history for the Blue Jays and the Bruins. MIT doesn’t have a top-ranked athlete on the Descending Order List, but features four in the top-5. One of the strongest event groups for the Engineers is the pole vault, with Jacqueline Ahrens (No. 4) and Kari Stromhaug (No. 5). This past weekend MIT also notched the second fastest DMR time of the season (11:43.54). Johns Hopkins also tallied some important marks this past weekend as its runners are jumpers stormed into the top-5. The Blue Jays were led by Therese Olshanski (No. 3, mile), Caroline Smith (No. 6, mile), Maya Hammonds (No. 4, long jump) and their DMR (No. 3). Taryn Cordani helped the Bombers move up one spot from last week thanks to her effort in the 3000. Cordani crossed the finish line in 9:39.31, which puts her No. 2 on the Descending Order List. Katherine Pitman improved her top mark in the pole vault to 4.21m (13-9¾). Sarah King continues to be the driving force for George Fox. King is ranked No. 2 nationally in both the 200 and 400 and recently moved up to No. 5 in the 60 this past weekend. Nebraska Wesleyan and Washington (Mo.) both jumped into the top-10 as the former went from No. 16 to No. 7 and the latter from No. 21 to No. 10. The Prairie Wolves and Bears each own two top-5 marks in the Descending Order List. Outside of the top-10, teams like Tufts (No. 29 to No. 11), Brockport (No. 30 to No. 14), UW-La Crosse (No. 45 to No. 16), Carthage (No. 32 to No. 18) and UW-Whitewater (No. 36 to No. 22) all witness upward movement.